UPTOWN — This is moving month for a lot of Chicagoans, so Flats Chicago is luring potential tenants with a free month of rent if they decide in May to make a Flats apartment their new home. The offer is for anyone who signs a two-year lease with Flats anytime from now until May 31 and chooses an apartment costing between $870 and $2,500 a month. With a lot of folks’ leases expiring in late spring and early summer, this is “a prime month for moving in the city,” Flats co-founder Jay Michael said in a statement about the deal Wednesday. “Not only do we want to give renters an easy reason to call Flats home, but also an incentive for going through the moving process,” he said. Four of Flats’ nine North Side apartment buildings are ready to be occupied: 2500 N. Clybourn Ave. in Lincoln Park; 4875 N. Magnolia Ave. and 5051 N. Kenmore Ave. in Uptown; and 5411 N. Winthrop Ave. in Edgewater. The other buildings, including 1325 W. Wilson Ave. in Uptown, are still being renovated and will begin to “come online throughout the summer and into next year,” a spokeswoman said. The Lincoln Park property is the priciest to occupy of the finished buildings. A one-bedroom apartment there costs at least $1,900, about $800 more than a typical one-bedroom apartment at Flats’ Edgewater and Uptown locations. The cheapest Flats apartment is an $800 studio at the Magnolia building in Uptown, and the priciest is a $2,500 three-bedroom on Kenmore in Uptown. 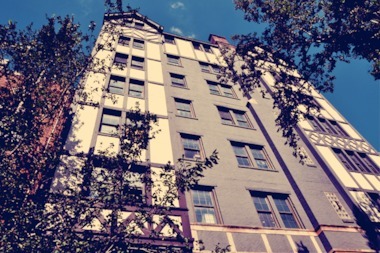 Most Flats buildings are vintage apartments — including former single-room occupancy buildings for low-income people that had been in disrepair — that the company bought to give trendy makeovers. For a complete listing of prices and apartments, click here.